Is there anything more precious than family? We think not. 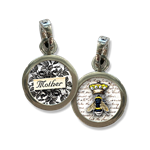 Honor your nana, mom, sister, or daughter with one of these heartfelt, beautifully crafted, unique charms. Or wear one yourself to acknowledge the power and blessing of family.